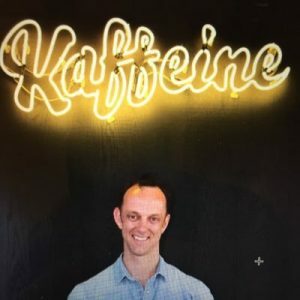 We interviewed one of our ViewVo Experts, Peter Dore-Smith, owner and founder of award winning London coffee shop Kaffeine, to find out what it’s really like starting a coffee shop business. – What are the highs and lows? – What does a typical week look like? – What are the main skills you need? – What are the barriers to entry? – What income can you expect to earn? Peter has a diverse background, including working in restaurants, bars, cafes, and nightclubs. Drawing on over 30 years’ experience, Peter also used to work in a school teaching hospitality, so knows what’s important for you to learn to enable you to open your own coffee shop. Peter’s awards for Kaffeine include ‘Best Independent Cafe in Europe’ and he is regularly awarded gold standard for ‘Best Independent Cafe UK’. If you want to earn from the one of the best in the business, read Peter’s advice below…. One of the biggest rewards for me is the people who work for me and seeing them come through and be successful, either continuing to work for me or leaving to go on and be even more successful in their next venture. Giving people the opportunity to learn and grow is one of the high points for me of running a coffee shop. And not getting enough sleep! Even though I have a good, balanced lifestyle, and get to spend quality time with my family, owning your own business is something that can keep you awake at night! For the most part, it’s a very enjoyable life. As long as you have structures in place – such as managers who know what they’re doing. You’ve got to set yourself up so your business can run itself without you but you’ve also got to accept that, when you open your own business, you will have to be able to deal with everything. 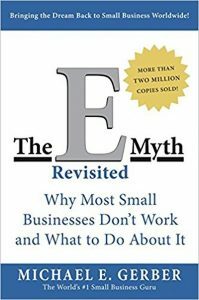 There’s a great book I’d recommend called The E Myth Revisited, which explains that you’re essentially creating a business that’s a product, and you’re trying to make your product as valuable as possible, so that one day someone will hopefully come and buy it. And in doing that, you’re putting systems and procedures in place that will then also make your life better and easier. The more you do that, the more structure you have, the better it’s going to be for you. Overall, you need to have a good level of skills in all areas. I’m not a barista but, if required, I can make coffee. If required, I can work in the kitchen, I can do a bit of service. You need to understand your figures. The more you understand about your numbers, the better. You need to understand what your P&L is, your GP, wage costs, rental costs, how VAT works etc. You need to know how to fix things. I know how to unblock a sewer! When you own a coffee shop, there’s every possibility that your sewer will block up! And it’s really expensive to get it fixed, so the more you can do yourself, the better. You’ll need to know practical things like how electricity works, where to turn your water main off if a water pipe bursts, how to fix a toilet. There are so many different things you can learn to do yourself to save yourself some money. It’s funny, if you ask me what I actually do, it’s hard to say but I do have massive lists of things to do! I get lots of emails, so spend some time responding to those – a lot from people trying to sell me things or get me to sell their products in the cafe. I try and delegate some of the work to my managers. It depends on the week. There are times when I’ll be working on service and might do a few shifts a week on service, if we’re short staffed. I have to take care of advertising/recruiting for staff, writing job descriptions, updating recipes, writing operation and training manuals, payroll, rosters for the week ahead, invoices (work out what’s come in, how much we’ve spent for the week), checking bank statements and forecasting for the year ahead. A coffee shop can be seen as a relatively easy business to run but, when you have no experience whatsoever of running your own cafe, you’re putting yourself on the back foot at the beginning because you’re going into competition with people who do have lots of experience. Having experience in hospitality is great but you still need to know a lot of other things in order to open your own coffee shop. It’s a challenge. You can certainly do it but it will be challenging. It’s hard work still even for me, and I’ve got over 30 years’ experience in hospitality. People often underestimate how hard it’s going to be. What income can you expect to earn? That’s a hard question to answer because it very much depends on your location. It also relates to what else you’re selling in the shop to help supplement your income, and your marketing, how your shop looks, how fast you’re servicing. A cup of coffee in London is around £3.00, but you need to take off VAT, so that means you’re only taking around £2.40 per coffee. You need to try to increase the amount people spend, selling cake, breakfast etc. If you’re looking at someone spending around £5.00 per head and you’re open 10 hours a day, that’s 600 minutes. Then let’s say you can serve one person per minute, that’s 600 people per day, which means you could be earning £3,000 pounds per day. However, you’re unlikely to get 600 people in per day. So, maybe 200, which equates to around £1,500 per day. You’ve got to take into account your costs though – your main one being wages. 35-40% of your net revenue is likely to be going on wages. In your early days, maybe 50% because you’re not making enough money. Your rent could be from 5-20% of your net revenue. Food costs are likely to be around 20%. Electricity, water, banking, 1% each. So, you’re not left with a big percentage of your revenue! You’ve really got to look at all your costs and work out how many customers you need each day and how much you need them to spend. Peter is one of ViewVo’s experts, offering advice and shadowing opportunities to those wanting to learn all about starting a coffee shop business. If you’re thinking about opening your own coffee shop, click here to find out how Peter and ViewVo can help you. You’ll learn everything you need to know to make opening your own café a reality. From planning to pricing to product, business plans, mood boards, equipment and how many coffees per day you may make & how important food is, as well as a café tour of the local area – looking at what works and what doesn’t. Previous Have you ever dreamed about starting your own craft business? Claire Gillespie, founder of successful craft business, Oglee Poglee, shows you how to make it a reality.